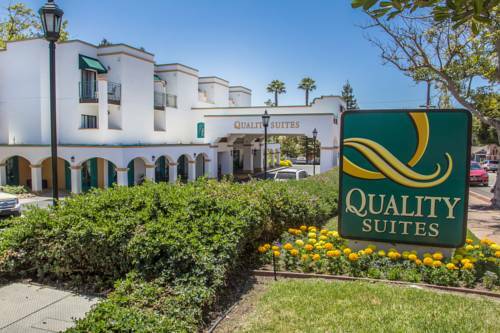 Get more for your money at the Quality Suites Downtown San Luis Obispo hotel in San Luis Obispo, CA, located off of Highway 101 near Amtrak. Nearby destinations include Avila Beach Pier, California Polytechnic State University, San Luis Obispo Visitors Center and San Luis Obispo Childrens Museum. Take advantage of free hot breakfast, free WiFi, free airport transportation and an outdoor heated pool. Rooms include a flat-screen TV, refrigerator, microwave and coffee maker. Also, earn rewards including free nights and gift cards with our Choice Privileges Rewards program. As of 02/19/15 no pets are allowed. - San Luis Obispo Co. Arpt.